Maybe not the most compelling title for a post, but the news that Lars Svensson is not renewing his term as Deputy Governor of Sweden’s central bank (HT Saroj Bhattarai) will be of great interest to academic macroeconomists. What I want to suggest here is that it should also be of wider interest. Apart from making major contributions to the discipline, Svensson has also been extremely influential among policymakers, and is often associated with the idea of flexible inflation targeting. (Here is just one example.) It is interesting news because of why he is leaving. He says: "I have failed to find support for a monetary policy that I believe would lead to better performance, with both a higher inflation rate closer to the target of two percent and a lower unemployment rate." He has for some time been fighting a losing battle to persuade his colleagues that current Swedish monetary policy is too deflationary (see for example Britmouse), and he has decided to give up the fight. Interest rates in Sweden are low, at 1%, but according to Svensson they should have got there faster and should now be even lower. Here is a plot of inflation (blue, left hand scale) and unemployment. Inflation is currently zero, so well below the 2% target. 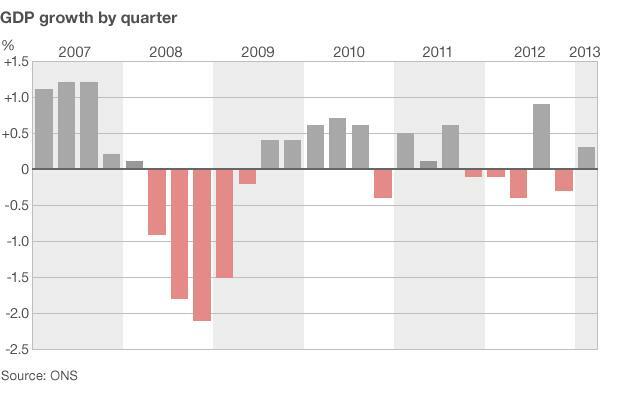 GDP growth was 1.2% last year. 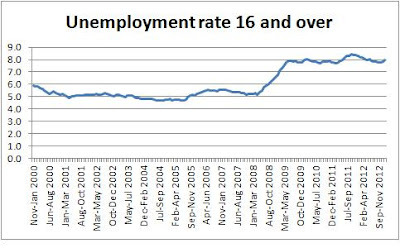 Unemployment rose in the recession, came down a bit, but has begun to rise again. The case for lower interest rates over the last two or more years looks pretty clear. So why have most of Svensson’s colleagues not been following his advice? 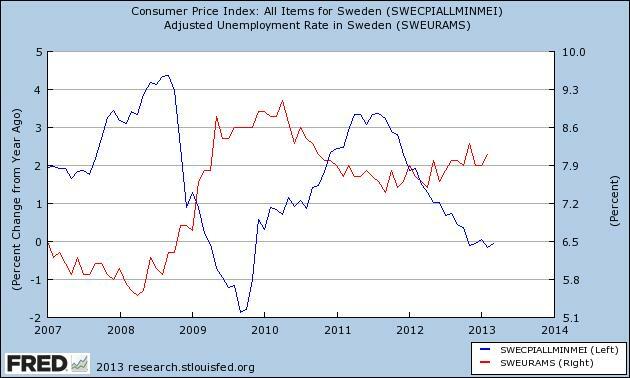 Their concern is that low interest rates are encouraging Swedes to borrow too much. Now of course one of the ways monetary stimulus is supposed to work is that it encourages more borrowing, but the worry is that borrowing in Sweden is dangerously high, and could threaten financial stability. There are echoes here of doubts expressed by some members of the Fed (see here and here) and international organisations (Tim Taylor here). However so far these have been just concerns, which do not seem to have had a major impact in preventing expansionary policy. Except in Sweden. Svensson’s arguments against such concerns are persuasive (pdf), and I find the argument that there are better financial instruments available to deal with these problems particularly strong. However I want to draw a slightly different parallel, with policy at the ECB. At first sight similarities appear slight: although both central banks are resisting a cut in interest rates from low to very low levels, in the Eurozone growth is negative rather than just slow, and inflation is currently only a little below target rather than zero (although the ECB itself expects it to fall to nearly 1%). In addition, the ECB has not focused on financial stability as a reason for not cutting rates. Yet the parallel is this. In both cases we have central banks making decisions that appear to contradict the wisdom of mainstream macroeconomics. So what, you may say, but in both cases the cost is being measured in unnecessary unemployment, and below target inflation. Compute the cost in terms of lost output, and they are the kind of losses that could cost a politician their job. The cost in terms of human misery is greater still. You may be pretty skeptical of the wisdom of macroeconomists, but do you really think that these central bankers know better? There has been considerable interest in the recent IMF study that found that the responsiveness of inflation to the output gap (or equivalent measure) falls at low levels of inflation. But if the econometrics is right (and Nick Rowe has some cautionary tales here), what is the explanation for this? I start with two standard stories, but then suggest other possibilities that are specific to current financial conditions. One standard explanation which the paper itself gives is based on the menu cost model of price inertia. The idea is that firms do not change their prices that often because there are costs to making any change (which economists call menu costs, perhaps betraying how often they spend in restaurants rather than buying food in supermarkets), and that often this cost might be higher than any benefit to profits in making a change. If you derive the aggregate relationship between inflation and the output gap from a model of this kind, the coefficient on the output gap will depend on how frequently prices are changed. So if price changes become more infrequent at low levels of inflation, the sensitivity of inflation to the output gap will fall. Another quite plausible story which has solid empirical backing is that workers particularly resist nominal wage cuts. That actually implies an asymmetry in response rather than a general reduction in sensitivity (if the output gap was positive workers would happily see wages rise), but it will affect the average response in an econometric study that does not allow for asymmetry, and in current circumstances it is an entirely appropriate story. You might think that enough, but I have a UK-centric reason for wanting more. In the UK, the ‘wages’ Phillips curve does not seem to be showing any reduction in sensitivity - indeed perhaps the opposite (although any additional sensitivity seems to predate the recession). That does not mean workers are not resisting nominal wage cuts, but the overall impact of this has either been small, or has been offset by something else. The story I want to tell involves firms’ pricing behaviour, and the role of more risk averse banks. Suppose a firm sees demand for its output fall. Its profits are lower, but it calculates that it can reduce that decline in profits by cutting its price, if that price cut increases demand. There are two risks involved in doing this. First, the price cut might raise demand by much less than expected, with the consequence that profits fall further still. Once the firm realises this it can always put prices back up again, but in the short run profits will decline. Second, it may take time for the price cut to feed through into higher demand: those buying competing products may not immediately realise that they should switch. So although profits might rise eventually, they could fall in the short run. So in both cases, there is a risk that profits in the short run might suffer as a result of the price cut. In normal times firms would be prepared to take those risks, either because the risks are symmetric (maybe demand will increase by more than expected), or because they represent an investment with a positive eventual payoff (as customers switch products). Critically, even if the short run might actually bring losses rather than profits, the firm’s bank will cover the losses because it is taking a long term view. However, since the financial crisis, the firm may have noticed that the behaviour of its bank has changed. It refused the business down the road any credit, even though by all accounts its difficulties were clearly temporary. Although the firm would like to cut prices in the expectation that this will eventually raise profits, if the price cutting idea does not work out and the bank plays tough that could mean bankruptcy. The idea is that the aftermath of the financial crisis, by raising the risk of bankruptcy associated with short term losses, has lead to greater price rigidity. In addition, there are two related effects that could actually lead to higher inflation in the short run. First, the firm does not like the fact that it can no longer depend on the bank to cover any short term losses. Who knows what might happen. So although a price increase might reduce profits if sustained (as customers gradually switch), in the short run profits will rise, and that allows the firm to pay off those debts which would otherwise keep its owners awake at night. This is the firm as a precautionary saver. Second, firms might be keeping prices low not because of existing competition, but because of the threat that a new start-up might emerge and steal some of its business. The one silver lining of the financial crisis for existing firms is that new start-ups are much less likely to get any money from the bank, so this diminished threat of new entry allows the firm to safely increase its profit margins. I have absolutely no evidence that any of this has been happening, or indeed whether these ideas stand up to serious analysis. I don’t know of any papers that have explored the impact of financial frictions of this kind on prices, but that may well be my fault, so please point me to any you know. If there is anything in these ideas, then they caution against interpreting any current rigidity in inflation as evidence against demand deficiency. Suppose monetary policy attempts to minimise this combination of excess inflation and the output gap each period, where we ignore discounting for simplicity. where ‘u’ is what is often called a cost-push shock, so it could be an increase in sales taxes for example. (Really it stands for all the things that might influence inflation besides expected inflation and the output gap, which is probably quite a lot.) The parameter ‘a’ measures how sensitive inflation is to the output gap. Cost push shocks are in some ways the most difficult things for monetary policy to deal with, if we are ignoring uncertainty. Demand shocks that create negative or positive output gaps can in principle be eliminated entirely by an appropriate choice of interest rates. Supply shocks that change the natural rate, if known, can also be dealt with at zero cost by just moving demand to follow supply. A non-zero value of u will however result in some cost whatever policy does. Let’s look at the case where there is a large positive cost push shock, just in the current period (t=0), and let’s make it equal to 10. This means that if the monetary authorities chose a zero output gap at t=0, then current inflation would be 10% higher. A crucial assumption here is that future inflation, assuming no known future shocks and a zero future output gap, is anchored at target, so excess inflation at t>0 will be zero. We can see in this case that by choosing a zero output gap at t=0 involves a loss of 100 at t=0, but no subsequent loss. where the parameter d=c/a. Now if it so happens that d=1, this policy involves keeping nominal GDP constant. Any excess inflation is exactly matched by the same percentage negative output gap. Now if d=1 because both c=1 and a=1, then using the Phillips curve we can show that the optimal policy will be to have a 5% negative output gap, 5% inflation, with a total cost of 50. That is a lot better than the cost of 10% inflation. This is why, I would suggest, Michael Woodford is comfortable with targets for the level of NGDP. (A good technical reference on optimal monetary policy is here, where the equation above is an example of his equation 1.21, while his views on NGDP targets can be found here, pages 44-46.) Note that I have not had to invoke anything about the zero lower bound (ZLB) – indeed I have ignored it – which is why I have pointed out before that the case for NGDP targets does not rely on ZLB considerations. So this is either good or bad news for NGDP advocates, depending on your views of these two key parameters. However there is a lot left out of this simple story, such as what happens if the Phillips curve is more backward looking, or if policymakers and the private sector make mistakes. Note that the price level at t=2 in this case is just 2% higher than without the shock, compared to 5% higher when we only changed current period output. This gives us a clue to what will happen if we allow output even further ahead to change optimally – see the next footnote. If we allow policymakers to make promises about the output gap in period t=2 and beyond, we can get the cost of this shock down further still: what we get are more conditions like the last equation, for each subsequent period. The policymaker promises smaller and smaller negative output gaps, so future excess inflation approaches zero from below. What happens then is slightly magical: by summing all these conditions together, we find that all these future negative inflation rates sum to exactly offset the initial rise in inflation, so (if target inflation was zero) the price level eventually returns to its pre-shock level. More generally the optimal policy involves gradually returning the price level back to its original path. In this sense, long run price level targeting is optimal whatever the value of d.
 If c=1 but a=0.5 (and estimated 'a' is normally a lot smaller than this - Charlie Bean in the small model simulated here uses a=0.025), then in the first example the output gap should be -4%, and inflation would be 8%. Although that produces a total cost of 80, that is the best we can do. If the output gap was -5%, inflation would be 7.5%, giving a total cost of over 81. Keeping NGDP constant would reduce output by 6 and two thirds per cent. Although, compared to the optimal policy, inflation would be a bit more than 1% lower, output would be nearly 3% lower, and the total cost would be nearly 89. As I have already begun to read the mind of Michael Woodford, let me continue with my audacity. Michael Woodford first showed us how you can derive the first equation from a standard utility function in a model with Calvo contracts. If you do that, the ‘c’ parameter (which is actually is a function of 'a' along with other parameters) can be a lot less than one, so the chances of ‘d’ being close to one despite small 'a' are greater. The problem I have with this logic is that I do not believe the simple models used to derive these cost functions accurately capture the true costs of output gaps, in part because they typically exclude involuntary unemployment. This extremely weak growth from a starting point of a deep recession should spell disaster for employment. But it has not, as this second chart from the Bank of England’s February Inflation report shows. The upside of this incredibly poor productivity performance is that employment has been much more buoyant than the GDP numbers would normally imply. However a moment's thought reveals that this could be really bad news, because it might imply that the recession has led to a permanent reduction in what the UK economy can produce. I say ‘could’ and ‘might’ advisedly, because the reasons for this productivity disaster are almost totally mysterious, as I discuss here. Yet it helps explain why inflation has remained above target, and gives us a reason (although not in my view a justifiable one) why monetary policy has not been more expansionary. Is this a reason for thinking that in fact policy in the UK has not been too bad, and that really we are suffering from some unexplained malady that the usual medicine (continuous monetary expansion and fiscal stimulus) could do nothing to cure? 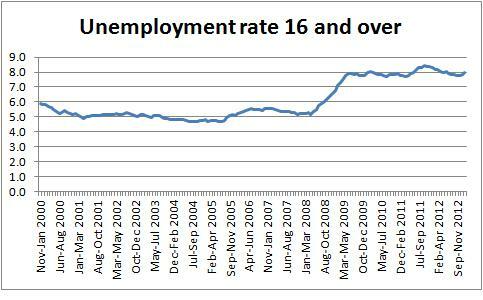 So we come to my third chart, which is UK unemployment (source ONS). Despite strong growth in private sector employment, which with stagnant GDP gives us our second chart, unemployment remains high. Low earnings growth suggests that this level of unemployment is keeping real wages low, so there is no suggestion that this increase since the recession is in any way structural. (The wages Phillips curve in the UK continues to work as normal, with a natural rate way below 8%.) It reflects in part a significant increase in labour force participation (again quite different from the US), but that is no excuse to allow it to remain high. So policy clearly has not and is not doing enough to expand demand. 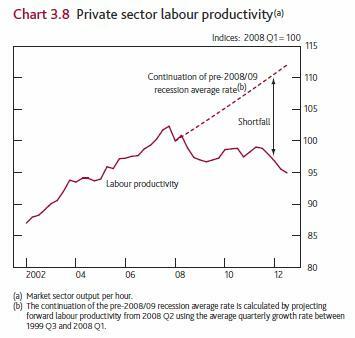 If it did do much more, with any luck productivity would start growing again and catch up some of the ground it has lost, but even if it does not this third chart shows us that expansion is the right policy. What has been happening instead is that fiscal policy has been working in the opposite direction, contracting demand, and monetary policy has been unwilling or unable to offset this. It is indeed one of the major UK macroeconomic policy errors since the second world war. As an illustration of this sad state, the normally excellent Stephanie Flanders describes 0.3% as "good news". A better description would be pathetic. How can an annualised growth rate of 1.2%, in an economy that pre-crisis had a trend growth rate above 2%, and at the bottom of a deep depression, be described as good news! If you think I'm biased, read John Van Reenen. I have not, until now, written anything about prospective Scottish independence. In part I admit this is because the vote is a long way off (18th September 2014), and the polls have consistently suggested that the Scottish people will reject independence. However if television keeps showing reruns of Braveheart who knows what might happen. What is clear is that macroeconomics, rather than distorted historical facts, is crucial to any informed decision. Today the UK Treasury has published a detailed analysis of the choices an independent Scotland would face in deciding on an exchange rate regime. Partly because of pre-publication spin, but also because the document itself is very negative in tone, its arguments may be dismissed as propaganda. This would be unfortunate, because there are some real and serious problems that the paper identifies. So let’s not ask here whether independence is a good idea, but instead if the vote for independence is yes, what next? Throughout I will refer to the remaining UK after independence as rUK, rather than as the ‘continuing UK’ which the Treasury document uses. The policy of the Scottish National Party is to retain the use of sterling (although previously it had talked about joining the Euro), rather than have its own currency. The debate about fixed versus floating rates, or the cost and benefits of currency union, are as old as macroeconomics itself. Yet what is happening in the Eurozone clearly puts a fresh perspective on this debate. It illustrates that the key issues are as much fiscal as monetary. In terms of setting interest rates, existing arrangements could carry on almost as if nothing had happened. The MPC could continue to set monetary policy under a flexible inflation targeting regime, where the inflation target continued to be for the whole sterling union. There would be some changes in detail (external members could no longer be appointed just be the rUK Chancellor), but the MPC could remain as accountable to both governments as it is to the single UK government. This is one advantage of having a currency union of 2 rather than 17. The costs and benefits of this for Scotland would be the standard Optimal Currency Area issues, noting that the scope for migration between the two parts of the sterling union is quite high. Scotland would inherit a significant proportion of UK government debt. So a key question is, would the Bank of England act as a Lender of Last Resort (LOLR) for that debt? As Brian Ashcroft notes, there is no way the UK government will allow the Bank of England to become sufficiently independent that it could refuse to act as a LOLR for the rUK government. So the Scottish government cannot be equal to the rUK government in this respect. If the Scottish government wants the Bank of England to act as a LOLR for Scotland, it has to persuade the rUK to allow it to do so. If the new Scottish government asked the Bank of England to act as a LOLR for its government debt, what price would the UK government ask in return? If the Eurozone experience is anything to go by, they might impose tough restrictions on Scottish fiscal policy - their own version of the Eurozone’s fiscal compact. This might reduce the risk of a market crisis, but the Scottish government cannot relish having rUK constantly monitoring and prescribing its fiscal decisions in the way the Troika currently does for some periphery countries. rUK might want to impose such conditions just to act as a LOLR for Scottish financial institutions, even if it did not do so for the government, on the basis that otherwise it could not be sure the Scottish government would be willing or able to pay for such support. Would tight fiscal restrictions on Scottish government borrowing matter? In the longer term you could argue that, with exhaustible oil money playing a large role for a newly independent Scotland, it should be building up a sovereign wealth fund along Norwegian lines, in which case large budget surpluses would be the norm. In other words it should be choosing a tight fiscal policy in any case. The problem is one of transition. The UK economy is almost certain to still be very depressed at the end of 2014, and Scotland’s macroeconomic position in this respect is similar to the UK average, so it will clearly not be the moment for a sharp tightening of Scottish fiscal policy relative to rUK. Is it inevitable that any sterling currency union would involve imposing a more restrictive fiscal policy on Scotland than it would experience without independence? In a previous post I outlined how the ECB could set conditionality for its LOLR role (OMT) in such a way as to avoid imposing an unnecessarily tight fiscal regime. I argued that they just need to be reasonably sure that the government will remain solvent, and suggested a way this could be done. The Scottish government could ask for a similar arrangement from the Bank of England. The arrangement I suggest requires that default would happen if the central bank believes the government is not solvent, so a significant default premium on Scottish debt would remain. (In contrast, LOLR would in practice be unconditional for rUK, so rUK would have a smaller default premium.) However the sterling equivalent of a fiscal compact, or worse the equivalent of Troika control, would not be imposed on Scotland. The Scottish government might propose such an arrangement as an alternative to Eurozone type controls. It could argue, with some justification, that this arrangement was in rUK’s own interests, because the alternative policy of squeezing Scottish fiscal policy would damage rUK. It could note the harm that the current fiscal restrictions on the Eurozone periphery were doing to exports from the core, and overall political stability. rUK, but its response will be to impose tough fiscal restrictions to avoid that happening, even if it does not agree to act as a LOLR. The real problem for Scotland is that, in forming a sterling currency union, it will be dealing with a government that thinks like Germany. What is worse, although Germany can sometimes be persuaded to go against its austerity instincts for the sake of European unity, after an independence vote rUK is unlikely to let its heart strings be pulled in a similar way! The problem for Scotland is that the rUK can provide something that in fact costs it very little, but the absence of which would cost Scotland a great deal, so rUK will be able to ask for a high price. Unless the new Scottish government is prepared to pay for a Bank of England LOLR role with some of its oil revenues, it may find it has nothing to bargain with. If no agreement can be found, the Treasury paper is quite right to conclude that using sterling unilaterally would not be attractive for Scotland. So rather than accept damaging fiscal restrictions, the new Scottish government may end up with its own currency after all. In the middle ages those who could not afford to pay their debts were sent to prison by their creditors. An efficient solution to the moral hazard problem? Hardly, because the chances that the debtor could earn some money to repay something to the creditor from a prison cell were not high. So countries gradually developed rather more civilised bankruptcy laws, like Chapter 11 in the US. Yet we are seeing the equivalent of these medieval practices in Europe at the moment. Arguably the harm being inflicted on the people of Greece by its creditors is even more cruel, and more stupid. More cruel, because the harm is being done to those totally innocent of the original contract - children indeed, as Karl Smith notes. More stupid, because those doing the damage cannot see what they are doing, either by refusing to open an economics textbook, or believing that they somehow know better. Just look at these numbers, from the latest OECD economic outlook. But surely, you may say, those who lent money to the Greek government are entitled to have their money back (with interest). No one was forcing the Greek government to accept these loans, and the conditions that go with them. The creditors are justified in doing everything they can to pressure the Greeks to repay their debts, including threatening Greece with expulsion from the Eurozone. The fact that this is causing great human suffering and misery is just one of those unfortunate things, and perhaps a necessary lesson to make others think more carefully before electing governments that secretly run up unsustainable debts. If that is what you think, then I would suggest this view is the moral equivalent of locking debtors up in prison. It is also as stupid, because the damage being done to the Greek economy and its politics is making the scale of the eventual default greater than if some debt relief was allowed now. A fiscal contraction of this scale, in a country with no independent monetary policy, was bound to do this much damage. Any macro textbook tells you that. Those who believe that reducing one component of demand just changes its mix rather than its overall level display an ignorance which in this case is close to criminal. But, you may say, the Greek economy has become uncompetitive, and wages need to fall if the economy wants to stay part of the Eurozone. There is no escaping macroeconomic pain. True some deflation was necessary, but deflation on this scale is totally wasteful, and the immense harm it is doing is therefore avoidable. Once again, very simple macroeconomics tells you this. And, as Ryan Avent is the most recent to point out, the core of the Eurozone is making this competitiveness correction as difficult to achieve as possible. You might say that this chaos is required to achieve necessary structural reform. I seem to remember someone else once had a similar idea, which they called perpetual revolution. Unfortunately this would not be the first time creditors have laid waste cities in an effort to recover debts, as Peter Frankopan has reminded us. But it need not be like this. Let me end by quoting Robert Kuttner, from a review of David Graeber’s book ‘Debt: the First 5000 years’. [The Allies] wrote off 93 percent of the Nazi-era debt and postponed collection of other debts for nearly half a century. So Germany, whose debt-to-GDP ratio in 1939 was 675 percent, had a debt load of about 12 percent in the early 1950s—far less than that of the victorious Allies—helping to produce postwar Germany’s economic miracle. The lesson from the 1920s had been learnt. Whether this was done out of self interest, because a vibrant post-war Germany benefited everyone, or compassion, I do not know. But whichever it was, the creditors of the Eurozone could use some of that wisdom right now. No, I’m not talking about coding in excel - as someone who has in the past done plenty of empirical work, my overriding reaction is empathy with the researchers concerned. There - not so much by the grace of god but because no one bothered to check what we did - go us. What I’m talking about is the weak global recovery and a primary reason for it. But there is a link, which I will come to at the end. To be honest, this post is really just to encourage you to read this Vox piece by Kose, Loungani and Terrones, which comes from the recent IMF WEO report (pdf). It tells a story in pictures (particularly comprehensive and clear pictures) that I and others - most notably Paul Krugman - have been telling for some time. In the past I have often used cyclically adjusted primary deficits as a summary measure of fiscal stance, because they are readily available and comprehensive. However as an indication of fiscal demand impact they are not ideal - just think of the standard Ricardian Equivalence experiment. So occasionally I have looked at just government spending, which is what Kose et al do in their analysis. The key chart is below. What the chart shows is that government spending in the advanced economies has grown at a much slower rate in this recovery than in previous recoveries, and of course this recovery has been significantly slower as a result. In contrast, government spending in the emerging economies has been as rapid during the recovery as before the recession, and they have recovered rapidly from recession. Go into detail within the advanced economies group, and the pattern is clear: the greater the contraction in government spending relative to previous recoveries, the slower the recovery has been. Their analysis also shows us one of the reasons why this happened. The advanced economies started the recovery with debt to GDP almost twice its average level in previous recoveries. At the start of the recession this was not the predominant concern, and we saw some attempt at countercyclical policy in the US, the UK and Japan, as the chart shows. But this was short lived in the UK, and was also reversed in the US and Japan, as debt concerns took over. So we have one clear reason why the recovery from the Great Recession has been weak, and it also explains why it has been weaker in some countries than others. I’m sure its not the only reason, but is anyone seriously arguing anymore that it is not an important factor explaining our weak recovery? So the real mistake that Reinhart and Rogoff made was to push the high debt issue at the wrong time. It was I believe an honest mistake: high government debt is a concern, if only (but not only) because it makes politicians do the wrong thing in a serious recession. And of course the mistake would have happened anyway (in part because of Greece, and partly because of those who see reducing the size of the state as the overriding priority) - academics probably overestimate the importance of the research that politicians use as cover. But when history tells the story of why the Great Recession was so prolonged, charts like the one here will be what is shown. Mark Thoma has a reflective post on the ability of evidence to move us forward in macro. Noah Smith also has interesting things to say. I just want to add the following thought. If you think about some of the recent disputed empirical results (the 90% debt to GDP, expansionary austerity, cutting spending rather than taxes, multiplier sizes), they all involve relating policy variables directly to outcomes. And if we think about some of the reasons these apparent relationships turned out not to be empirically robust, it was because they failed to think about other things that might matter for outcomes. Lets be specific. Fiscal multipliers are bound to depend on what monetary policy is doing. In principle monetary policy can offset the impact of fiscal changes on output, but if monetary policy is constrained in some way, it cannot. So any empirical study of the impact of fiscal policy must control for what is happening to monetary policy. I have often written about why high debt may be damaging to growth, but these effects work through raising real interest rates, or discouraging labour supply. It just seems foolish to apply them to a situation where real interest rates are unusually low, and output is hardly constrained by a shortage of labour. These are simple, obvious points, but its amazing how often they are ignored. It is if some in the profession are desperate to find universal (and perhaps convenient) simple truths, in the face of the obvious fact that the macroeconomy is complex. This is not a new phenomenon. I’m afraid what follows is a personal anecdote, but it is topical. Monetarism was the centrepiece of Mrs Thatcher’s first government. Following Friedman, policy was based around the idea that there was a predictable causal relationship from the money supply to prices. Lags might be long and variable, but an x% change in the money supply would within a year or two lead to an x% change in prices. Parliament asked the new government to come up with evidence for this assertion. They agreed to, but for some reason I cannot remember, they promised to produce a working paper by a named Treasury economist, rather than some anonymous Treasury document. At the time I was working in the Treasury, and my job was to help forecast prices. So they chose me to produce this paper. I was to report each week to Terry Burns on progress. Terry Burns had been recently appointed as Chief Economic Advisor and he was one of the architects of the government’s new macroeconomic strategy. The first meeting went fine: I reported that if you regressed prices on the government’s chosen monetary aggregate, you got exactly the relationship they were looking for. However I had remembered some of the econometrics I had been taught. I was worried about omitted variables, and the fact that the two time series were dominated by one particular episode. To cut a long story short, the relationship fell apart if you either took that episode out, or added other explanatory variables like oil prices. Despite Terry and my best efforts, we could not rescue the relationship once you went beyond that first simple regression. To be honest I was not that surprised or unhappy about this, but for the government it was rather embarrassing. Pretty much all the econometric work I did subsequently involved more structural relationships rather than these simple reduced forms. I think we have learnt a great deal from estimating equations that at least try and get close to underlying behavioural relationships, whether its using cross section, time series or panel regressions. A carefully structured VAR may also tell us something. Perhaps an exhaustive robustness analysis running countless single equation regressions can reveal insights - as for example in Xavier Sala-i-Martin's AER paper 'I just ran two million regressions' trying to explain economic growth. But if the empirical evidence involves little more than a regression of outcome x on instrument y, be very very aware. Just in case anyone is interested, the expansion in M3 caused by the Competition and Credit Control reforms in 1973, and the increase in inflation associated with higher oil prices in 1975. What happened at that point is a story that I will tell publicly one day. It is probably of no interest except to those who were involved in UK policy at that time, but it reminds me of one of the nicest and most interesting acquaintances I made during my time at the Treasury who is greatly missed.